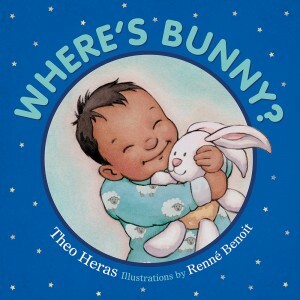 “At various points in the book, the question “Where’s bunny?” is asked, and each time this is asked, there is an opportunity to look for the bunny in the drawing on that page. Most children have a stuffy of some kind that is a favourite bedtime pal, and this let’s that be part of the ritual as well….Bedtime books are a great way to introduce routine to children, and make getting ready for bed a pleasant time….I also liked that the book showed diversity without being about diversity. 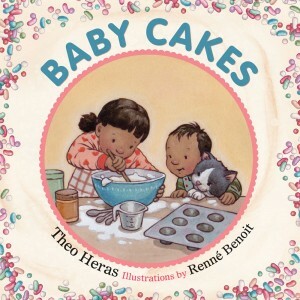 “Author Theo Heras and illustrator Renné Benoit’s very young brother and sister from Hat On, Hat Off and Baby Cakes have returned in a story about getting ready for bed and the routines involved with that evening ritual…. Theo Heras makes her text simple and readable for those just learning to decipher books, and it is sweetly appropriate for a concept book about bedtime routines. Many concept books tend to be flat, emphasizing only the concept in the simplest of texts. Thankfully Theo Heras does more than just assert a concept. There is a story here, one of sibling affection and a young child’s bond to his stuffed animal, that is elevated with Renné Benoit’s artwork. The children are so beautiful and angelic with their bright faces and cowlicked hair, and their surroundings are as soft and inviting to the reader as to the children. From Bunny with his carrot-topped hat and the towels and robes and bedcovers, Renné Benoit draws readers into the warmth of the children’s home and lives and asks them to stay for a bit. “Rating: E…Young children will be eager to try out baking in the kitchen after reading this sweet [padded cover] book. Baby Cakes is written in simple and accessible language, and delivered in a sturdy format for young hands. Recipes are included as well as lots of admonitions for baking with an adult.